At a White House event last week, Donald Trump was asked about upcoming congressional votes on his emergency declaration about the border. Would Republican lawmakers stick with him and oppose the Democratic resolution that would block his policy? "Oh, I think they'll stick," the president replied. "Yeah." That's plainly not what happened. The Senate voted 59-41 on Thursday to cancel President Donald Trump's national security declaration to fund a wall on the border, picking up the support of 12 Republicans to put the measure over the top. Trump has vowed to veto the measure, which would block him from making an end run around Congress to obtain billions of federal dollars to build the wall that has been set aside for other purposes. The vote represents an unusual bipartisan Senate rebuke to Trump's methods, which could play a role in coming lawsuits against the emergency declaration. As the dust settles, there were a total of 12 Republicans who broke party ranks and supported the resolution: Sens. Lamar Alexander (Tenn.), Roy Blunt (Mo. ), Susan Collins (Maine), Mike Lee (Utah), Jerry Moran (Kan.), Lisa Murkowski (Alaska), Rand Paul (Ky.), Rob Portman (Ohio), Mitt Romney (Utah), Marco Rubio (Fla.), Pat Toomey (Pa.), and Roger Wicker (Miss.). There would have been 13, but Sen. Thom Tillis (R-N.C.), who said he'd vote "yes," and wrote an entire Washington Post op-ed stressing how important his principles were, flip-flopped shortly before the vote and ended up toeing the party line. For the White House, the embarrassment is as unusual as it is deep. 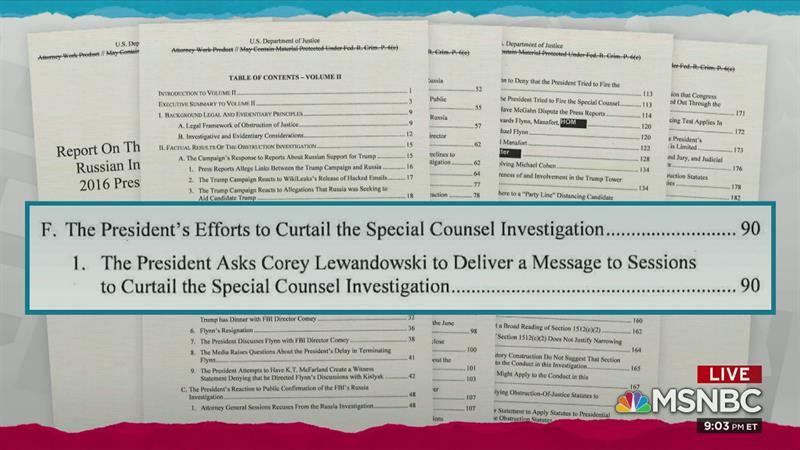 There's no shortage of questions surrounding a possible report from Special Counsel Robert Mueller. Will it exist? If so, will it be shared with Congress? Can it be subpoenaed? Will the public ever have access to it? Evidently, the Democratic-led House has an opinion on the matter. 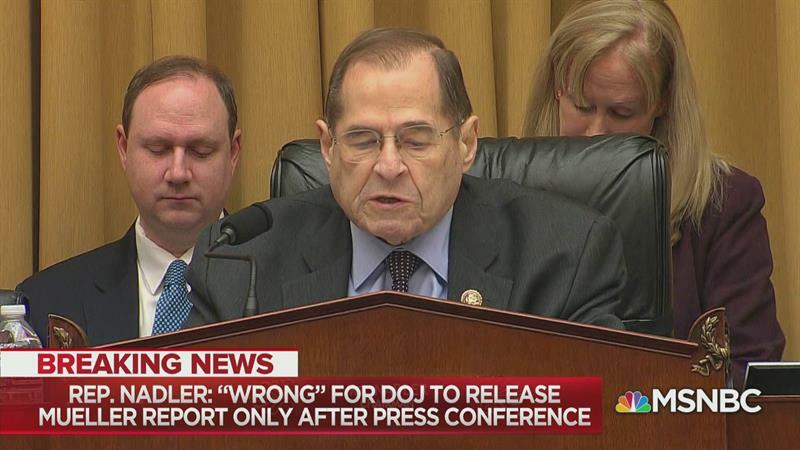 The House on Thursday overwhelmingly passed a resolution calling for special counsel Robert Mueller's report to be made available to the public and Congress. The measure passed 420 to zero, with four members voting present. The full roll call is online here. Note, seven members did not vote, there are a few vacancies, and four members - Michigan's Justin Amash, Florida's Matt Gaetz, Arizona's Paul Gosar, and Kentucky's Thomas Massie -- voted "present." As a practical matter, measures like these have a limited impact: at issue is a non-binding resolution, which the Republican-led Senate is very likely to ignore. If we assume Mueller completes a report, it will go to Attorney General William Barr, Donald Trump's newest cabinet member, who may try to keep the document under wraps. Indeed, that's a very real possibility. 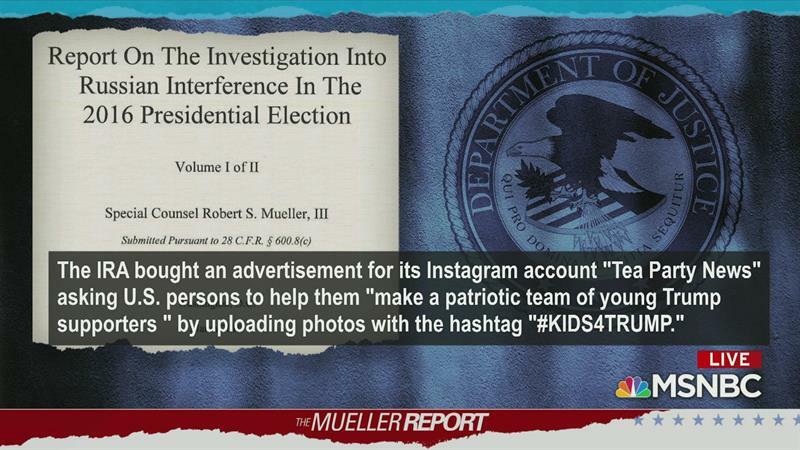 As NBC News' report this morning noted, while Barr is required to notify Congress after learning of Mueller's findings, "the rules governing the special counsel say those reports must amount to 'brief notifications, with an outline of the actions and the reasons for them.'" What's more, Bloomberg News reported last week that Rep. Doug Collins (R-Ga.), the top Republican on the House Judiciary Committee, said he'd met with the attorney general and it's the congressman's expectation that Congress and the public may only get "a short summary" of Mueller's findings, not a detailed report. That's exactly the outcome congressional Democrats hope to avoid, and the newly passed resolution is intended to keep the pressure on Barr to err on the side of disclosure. The Democrats' 2020 presidential field already has several senators, a couple of governors, a couple of mayors, a former cabinet secretary, and as of this morning, a former congressman by the name of Beto O'Rourke. The 46-year-old former congressman from El Paso has captivated some in the party with his skateboarding, adventurous road trips shared on social media, and crossover appeal to both moderates and progressives. In a video announcing his decision, released at 6 a.m. ET, O'Rourke said: "The only way for us to live up to the promise of America is to give it our all and to give it for all of us." He added: "This is a defining moment of truth for this country, and for every single one of us. The challenges that we face right now; the interconnected crises in our economy, our democracy, and our climate have never been greater. And they will either consume us or they will afford us the greatest opportunity to unleash the genius of the United States of America." When the Texan launched his U.S. Senate campaign ahead of the 2018 cycle, he looked like a longshot against incumbent Sen. Ted Cruz (R) in a reliably red state. But O'Rourke proved to be an adept candidate, who inspired a small army of supporters, and who very nearly upset the Republican senator. To be sure, presidential candidates generally don't parlay failed Senate campaigns into successful presidential bids. It has, however, happened once before: Abraham Lincoln had a fairly brief career in the U.S. House, lost a Senate race in 1858, and was elected president two years later. That said, I'd caution against too many O'Rouke-Lincoln comparisons. My point is to emphasize the historical rarity of the career trajectory, not to put the Texan in the same category as ol' Abe. Ordinarily, when a candidate enters a presidential race, I have certain reflexive reactions. I'll put on my pundit hat and start drawing conclusions about whether his or her campaign is sensible or foolhardy, likely to succeed or fail, driven by a compelling vision or a misguided fantasy. But with Beto, in all candor, I'm just not sure what to think. Ahead of today's Senate vote on a resolution rejecting Donald Trump's emergency declaration, Vice President Mike Pence took on an unpleasant task: lobbying Senate Republicans to put aside their principles, ignore the separation of powers, and follow the president's lead in the name of partisan loyalty. Oddly enough, those lobbying efforts appeared to be having some effect. As we discussed the other day, Sen. Mike Lee (R-Utah) has been working on revising the National Emergencies Act -- the law Trump abused to redirect funds to the border -- in order to restrict the scope of presidential powers going forward. If the vice president could get the White House's support for Lee's proposal, Pence was told, it might help persuade GOP senators to reject the bill on the emergency declaration. [On Tuesday] Vice President Mike Pence indicated to Republican senators in a closed-door meeting that Trump was open to Lee's legislation as a way to avoid an embarrassing public rebuke that would expose rifts within the GOP. And right on cue, as the New York Times reported, Trump decided he wasn't open to Lee's measure after all. A last-ditch gambit to spare Senate Republicans a hostile showdown with President Trump over the Constitution's separation of powers was torpedoed on Wednesday by the president himself, increasing the likelihood that the Senate will vote on Thursday to overturn the president's emergency declaration and force the first veto of his term. Soon after, the Utah Republican announced that he, too, intends to support the resolution intended to block Trump's emergency declaration. There's still some last-minute wrangling this morning, and I'll have a separate item later today on the fate of the measure in the Senate, but for now I have a related question: if Pence can't speak for the White House, why do people keep trying to negotiate with him? At issue is a silly idea, which gained new prominence this week following a segment on ABC's "The View," which argues that Donald Trump has made public appearances with a woman who only appears to be Melania Trump. In other words, according to the conspiracy theory, the first lady has a body double -- or perhaps more than one -- who sometimes travels with the president. There is no reason to take the conspiracy theory seriously, and I more or less assume that some of the folks who've peddled it are kidding. That said, Trump's tweet on the subject struck me as notable for a couple of reasons. The first is that he described the conspiracy theory the wrong way. News organizations are not manipulating photographs of the first lady -- if the White House has evidence of media professionals doing this, I'm all ears (or in this case, eyes) -- and if the president thinks pictures of his wife look like a different woman, he's only going to make this whole foolish mess worse. The second, however, is more important: since when is Donald Trump in a position to call others' conspiracy theories "deranged"? "The latest [Southern District of New York] fishing expedition is another example of blue-state liberal prosecutors carrying out their vendetta against [Donald Trump]. "Let's be clear: These are investigations in search of a crime – and their harassment has gone on for far too long." Right off the bat, it continues to amaze that Republicans, for all of their posturing about the party's respect for law enforcement, routinely offer bitter complaints about law enforcement. 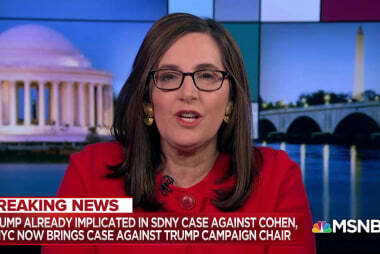 For that matter, the RNC's reference to the Southern District of New York points to one of the nation's highest profile offices for federal prosecutors. 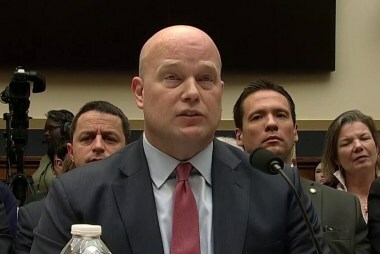 It's led by a U.S. Attorney who was appointed by none other than Donald Trump and confirmed by a Republican-led Senate -- making it an unlikely target for complaints from the RNC chair. But in this specific instance, those are just the surface-level problems with McDaniel's missive. The more glaring concern is that she blasted federal prosecutors in response to an investigation from the New York state attorney general's office -- and those two offices are not the same thing. They're both law enforcement, but blaming the Southern District of New York for the actions of the New York AG doesn't make sense. The former has no control over the latter. All of which leads to a related question: did the RNC chair simply make an embarrassing mistake or was this intentional? As Yemen's brutal civil war drags on, the scope and scale of the humanitarian catastrophe is simply staggering. Though the crisis is complex -- civil wars, especially in the Middle East, usually are -- Saudi Arabia's intervention in the conflict has exacerbated the nightmarish conditions. The role of the United States, however, cannot be ignored. We have, after all, extended considerable military support to our partners in Riyadh, which in turn has helped fuel the Saudis' campaign. A growing number of American lawmakers have seen enough. The Senate has voted to end U.S. support for the Saudi Arabian-led coalition's war in Yemen. The measure was co-sponsored by Sens. Bernie Sanders (I-Vt.), Chris Murphy (D-Conn.), and Mike Lee (R- Utah). The roll call on the Senate vote is online here. Note, most Senate Republicans opposed the measure, toeing the White House's preferred line, but seven GOP senators broke ranks, which was more than enough to advance the resolution. If this sounds at all familiar, it's because the upper chamber passed a similar measure late last year, before the Republican-led House killed it. Now, of course, a very different political dynamic exists: the Democratic-led House is almost certain to endorse the resolution passed in the Senate yesterday. Donald Trump, of course, will reject it, and proponents almost certainly won't be able to override the president's veto. But that doesn't make the developments any less significant. Judge Amy Berman Jackson couldn't have been much clearer yesterday. As Donald Trump's former campaign chairman, Paul Manafort, sat in her courtroom awaiting sentencing on the many felonies for which he was convicted, the district court judge went out of her way to separate the proceedings from Special Counsel Robert Mueller's investigation into the Russia scandal. "The question of whether there was any collusion with Russia ... was not presented in this case, period, therefore it was not resolved one way or the other by this case," the judge explained. Jackson went on to effectively mock Manafort's attorneys for peddling an irrelevant "no collusion" argument that, as she put it, was both a "non sequitur" and "unrelated to the matters at hand." She went on to question the accuracy of the "'no collusion' mantra," since the special counsel's investigation is ongoing. 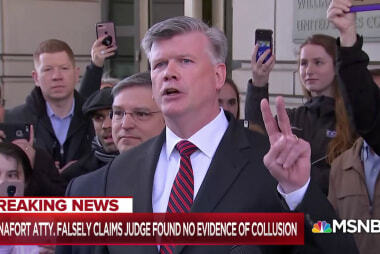 Manafort's attorney, Kevin Downing, heard all of this and proceeded to lie to reporters anyway, telling assembled journalists outside the courtroom, "Judge Jackson conceded that there was absolutely no evidence of any Russian collusion in this case." The absurd falsehood may have been intended to improve the odds of a presidential pardon, but it didn't make his comments any less foolish. "It was a hoax. It was all a big hoax. And now you are seeing it. Today again no collusion. The other day no collusion. There was no collusion." In all, he used the word "collusion" six times in 79 sentences, suggesting this is less of a talking point and more of a nervous tic. The president wasn't explicit about what he was referring to, but his multiple references to "today" suggested he was claiming vindication in Judge Jackson's remarks at sentencing. In other words, a federal judge said the case had nothing to do with question of collusion; she conspicuously rejected the "'no collusion' mantra"; and Trump apparently thought it wise to publicly declare that she'd said the opposite. * Why was the United States last to make the call? "President Donald Trump announced an emergency order from the Federal Aviation Administration on Wednesday grounding Boeing 737 Max jets in the wake of an Ethiopian Airlines crash Sunday and a Lion Air accident in October that together killed 346 people." * Brexit: "British lawmakers on Wednesday overwhelmingly rejected leaving the European Union without a deal, paving the way for a vote to delay Brexit to seek a way out of Britain's worst political crisis in generations." * The federal judiciary: "The Senate has confirmed President Donald Trump's nominee to replace Brett Kavanaugh on a high-profile appeals court. Senators voted 53-46 on Wednesday to confirm White House official Neomi Rao for a seat on the U.S. Circuit Court of Appeals for the District of Columbia Circuit." * On a related note, thanks to the ferocity of Senate Republicans' efforts, the 3rd Circuit Court of Appeals has flipped from having a majority of judges appointed by Democratic presidents to a majority of judges appointed by Republican presidents. As Lawrence Hurley noted, "This is the first of the circuits to flip since Trump took office." * Something to look out for: "The Trump administration is preparing to shutter all international offices of U.S. Citizenship and Immigration Services, a move that could slow the processing of family visa applications, foreign adoptions and citizenship petitions from members of the military stationed abroad." * Remember the Hatch Act? "Labor Secretary Alexander Acosta's tweets praising President Donald Trump have raised concerns inside the department about whether Acosta is violating a federal law that limits federal employees' political activities, according to documents obtained by Bloomberg Law." Soon after Paul Manafort learned of the additional years he'll serve in a federal prison, his attorney, Kevin Downing, spoke briefly to reporters outside the courthouse. It seemed likely the lawyer would offer a few perfunctory comments about his client's remorse, thank the judge, and move on. "Good afternoon, everyone," Downing said to a phalanx of journalists. 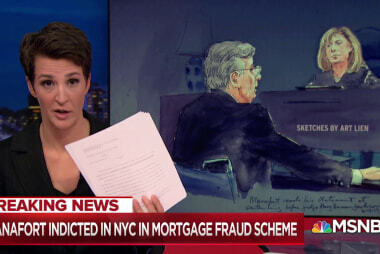 "For anyone who was in the courtroom today, what I'm about to say will not be a surprise. 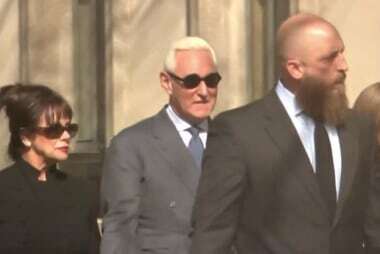 Judge Jackson conceded that there was absolutely no evidence of any Russian collusion in this case." It was at this point when protesters started shouting that Manafort's lawyers was clearly lying. But Downing kept going, adding, "Two courts have ruled no evidence of any collusion with any Russians." Manafort's legal team had suggested repeatedly in its sentencing memo that the fact that he hadn't been found to have colluded with Russia should be a mitigating factor when it came to how much time he would serve in prison. But Jackson not only rejected that argument in sentencing him to 43 additional months in prison, she also rejected the entire argument behind it. "The 'no collusion' refrain that runs through the entire defense memorandum is unrelated to matters at hand," she said. "The 'no collusion' mantra is simply a non sequitur." Then she added: "The 'no collusion' mantra is also not accurate, because the investigation is still ongoing." All of which leads to the second angle of interest: why Manafort's lawyer would make a claim like this that was so obviously and demonstrably untrue.